NEW ENGLAND expects a high-quality apple crop this fall with outstanding color as a result of the summer’s cool days and nights. The size of the 2014 New England apple crop is forecast by the U. S. Apple Association at 3.73 million 42-pound boxes, just over the region’s five-year, 3.52 million-box average. The crop is expected to be slightly smaller than 2013’s fresh harvest of 3.8 million boxes. The timing of the New England apple harvest so far is on schedule, with early varieties like Ginger Gold, Jersey Mac, PaulaRed, Sansa, and Zestar! already being picked. McIntosh, which accounts for about two-thirds of the crop, is expected to be ripe for picking soon after Labor Day in most areas. 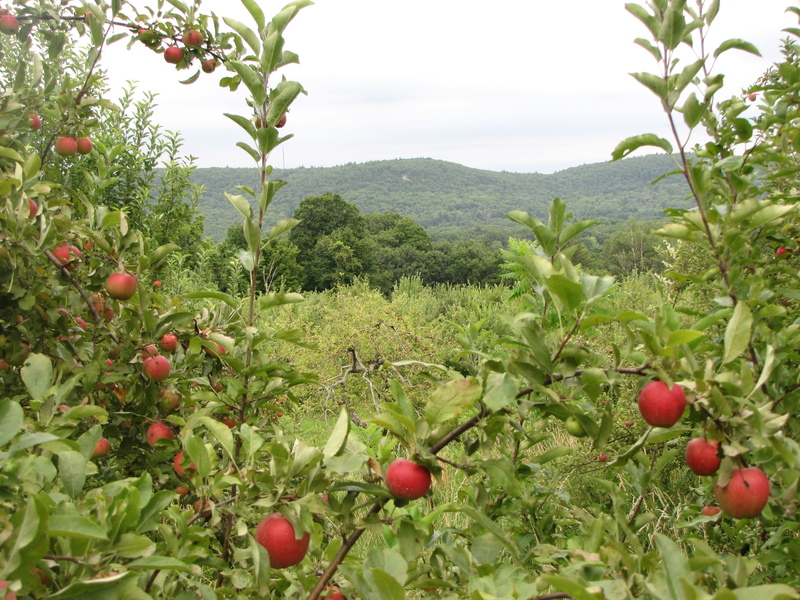 The 2014 fresh harvest officially will be launched with New England Apple Day Wednesday, September 3. The commissioners of agriculture of the New England states will visit orchards that day to sample the new season’s apples and meet with growers. Growing conditions in New England have been good throughout the spring and summer, with only scattered damage from frost or hail. Some apple varieties produce large crops biennially and have a low volume of fruit if 2014 is their off-bearing year. Some orchards reported losses due to the bacterial infection fire blight in every state but Maine, which expects a significantly larger crop in 2014 than in 2013, despite hail damage reported in the central part of the state (based on our informal survey, the increase in Maine may not be as great as the national report suggests). 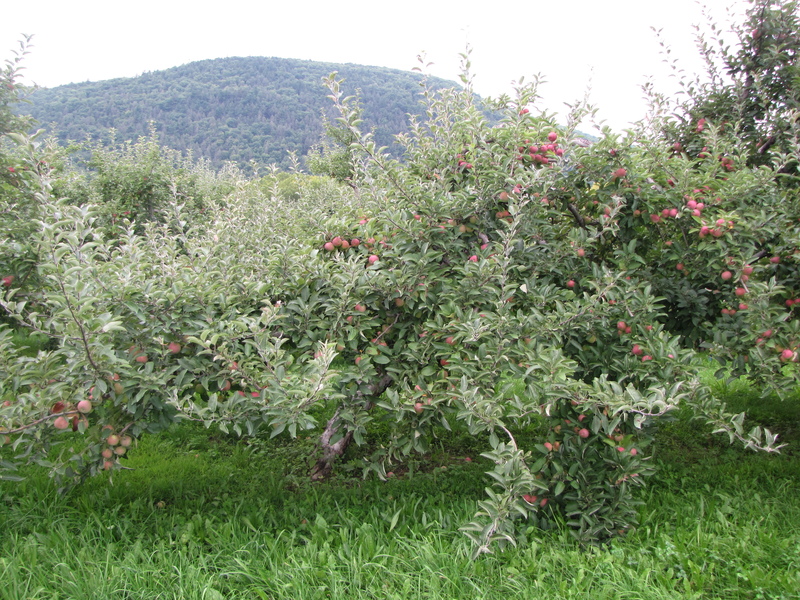 Elsewhere in New England, Vermont should harvest about as many apples in 2014 as a year ago, while the other states anticipate crops between 10 percent and 20 percent smaller than in 2013. Most of the region’s orchards expect to have plenty of apples of all varieties in a range of sizes. The 2014 United States apple crop is predicted at 263,804 million boxes, about 10 percent larger than in 2013, according to USApple’s annual forecast. Leading the way is Washington state, with a record crop predicted of 162 million boxes. New York expects to harvest 30 million boxes, a 24 percent increase over 2013, and Michigan will be slightly down from a year ago, at 28,740 million boxes. The 2014 national apple crop forecast is nearly 17 percent above the five-year average of 225,925 million boxes. WITH A NORTHERN CLIMATE similar to New England’s, Minnesota has produced several apple varieties that flourish in our region. One of these, the mid-season heirloom Wealthy, has a direct New England connection, developed by Peter Gideon from cherry crab apple seeds purchased from Albert Emerson of Bangor, Maine, in 1861. The apple that eventually resulted was named by Gideon for his wife, Wealthy Hull Gideon, and released in 1868. In recent years, the apple-breeding program at the University of Minnesota has developed several important cultivars, including Honeycrisp, the most sensational apple to be introduced in the past 30 years. Ready for picking in September, Honeycrisp has a unique texture and flavor that growers across the country are trying to replicate. It is a challenging apple to grow and its color varies widely, but New England’s growers produce some of the most outstanding Honeycrisp found anywhere. Two other recent varieties from the University of Minnesota are Zestar! and Sweet Sixteen. 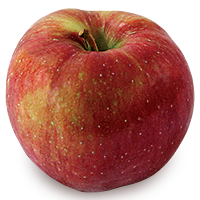 Zestar!, also known as simply Zestar or Zesta, is a medium-sized, early season apple, round in shape, mostly red in color over a yellow base. Its white flesh is crisp and juicy, and more sweet than tart. A good all-purpose apple, its flavor and texture make Zestar! one of the best of the new, early season varieties, though it browns easily, and it stores well for just a few weeks. Zestar! is the trademarked name for the variety, a cross between State Fair, one of the University of Minnesota’s lesser-known apples, introduced in 1979, and an unnamed seedling. Zestar! was released in 1999. Sweet Sixteen ripens later than Zestar!, in mid-season. It is a large, boxy apple, mostly red on a yellow-green skin, with prominent white lenticels (the dots on an apple’s surface, through which it respires). Sweet Sixteen’s yellow flesh is crisp and juicy. It has a sweet, spicy flavor with hints of citrus and vanilla. Sweet Sixteen was developed in 1973 by the University of Minnesota from Northern Spy and Frostbite parents. 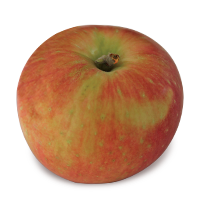 Introduced in 1977, Sweet Sixteen has the same parentage as another Minnesota apple, Keepsake (1978), a late-season apple that is Honeycrisp’s only known parent. To further complicate matters, both Keepsake and Sweet Sixteen were released decades before their Frostbite parent, which has only been available commercially since 2008. Frostbite’s flavor has been compared to molasses or sugar cane, accounting for some of Sweet Sixteen’s distinctive sweet flavor.